We try not to think about the statistics. The high divorce rate. The length of time forever entails. The number of problems we will encounter over the years. No, we just paint on that smile with fresh lipstick, teeter around on our white, satin heels, and wipe our mascara stained tears of joy with those heirloom handkerchiefs. 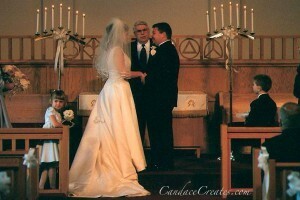 Their wedding day transported me back to the day I made the promise of forever to my husband. We were not quite as young and un-jaded as my nephew and new niece are, but on our special day, we had the same childlike, trusting faith that everything was going to work out. Faith telling us to trust in each other and know we would be together until the end of time. I knew this truth deep in my soul that sunny afternoon, almost 13 years ago, even though my past should have screamed there is no possibility of loving someone forever. My parents and their many subsequent spouses were not the best example for me. I married for the first time in my early twenties, certain I would stop the cycle of divorce in our family. Sadly, this did not come to pass. We struggled with addiction, constant arguments, and both sets of our parents teaching us divorce is an easy option. After three short years together, the birth of our precious daughter, and many trial separations, we ended our marriage. I have been through a large amount of trauma in my life, but my divorce ranks far up in the top of the list for pain infliction. Divorce hurts physically, emotionally, spiritually, and financially. We fought for two years before finalizing it, only to tragically lose my ex-husband to complications of diabetes a few months after the papers were signed. I still have gaping wounds today from that entire season of my life. I am immensely thankful I made the choice to say I DO again. My husband has loved me through much of the pain of my past. He comes from a family who sees marriage as sacred, and divorce as not an option. We have stayed together even when I didn’t think I could be married another day. I credit him for teaching me how to be angry with someone yet still love them at the same time. He adopted my daughter early in our marriage and has raised her as his own. I truly feel today I am living as God intended me to and it is a beautiful, peaceful feeling. It is inspiring to read about the way God has helped you through very hard trials. May he continue to heal the wounds from your 1st marriage. So glad that you have a husband that sees marriage the way God designed it. Thank-you for sharing your story. I am your neighbor at Monday Musings. Thank you Carol for your kind words. I feel very blessed to have such a wonderful man to share my life with. I am healing a little more every day. Your candor is so refreshing. I think EVERYONE about to marry should read your post. It is amazing and should really be circulated widely…..No, I do not know the pain of divorce, but yes, there have been times when I so felt like walking. While we do have a good marriage, there are rocky times, w/o a doubt. We need more like you to be realistic and honest around the triumphs as well as the struggles within marriage. When I see friends on FB write about their husbands all gushing and swooning and literally calling him the perfect man, I’ve thought, wow, they must have amazing marriages…but really how can that be? It does not seem possible. For quite some time, I felt awful b.c I assumed I had a marriage that was not “story book” while so many others did. My hubby has long since given up buying me jewelry and yet he does other things for me. Most are intangible and they are the best things. We are married almost 17 years and I would def do it all over again, despite the rocky parts. Your posts are always so welcome…in fact, I saved your post in my inbox so that when I took a break, I could read and savor it and not be rushed. Getting back to algebra with one of my kids and science with another and then we are pretty much done for the day. THANK YOU for your insight and inspiration. Really. Love changes through the years, not saying it diminishes it just grows differently. Your right be realistic, we have ups and down in any relationship. Its a blessing to grow in love in a marriage and still appreciate the other person. 17 years is a long time especially in the society we live in now. Mine lasted only seven years but I learned a lot in those 7 years before during and after. Not sure if I will marry again but I do want a companion to share my life with. True love last forever, I still love my ex-husband not in-love with him but the love of what we shared will always be there. Its just a different love now. I completely agree with you Camii that love changes over time. There are certain people who come into our lives that we will love forever regardless of their current status with us. I hope you find someone you can enjoy life with too. They usually seem to come along when we least expect it. Your incredibly sweet and thoughtful comment has made my day Chris. Thank you! Sometimes it is hard to be painfully honest to the world about your life and private issues but I feel it is what I am called to share at this time. I am in the no more jewelry buying days with you but as you said they move on to doing other things for us. I have learned to appreciate his level of commitment far more than a necklace. It is always a pleasure to hear from you! I was happy to see the recipe for your pencil cake in my inbox. My son and I are looking forward to making it. Thank you Mari! Showing your love daily is so important. I think people get too caught up in anniversaries, birthdays, valentine’s day… We need to make sure those close to us feel our love and support every day. I love your statement “marriage is one of the best schools life has to offer”- how true it is! I have learned a lot in the past 13 years about relationships, commitment, love, and life in general. Our faith in God has grown together as well over our time together. That third strand you spoke of, Jesus, is definitely the glue that bonds. Thank you for visiting and sharing your thoughts Gisela! Hi Candace! I am so happy to meet you today! I think that example and expectations are so important in commitment. I wonder how things would have changed with parents who were supportive of your saving your first marriage, instead of encouraging of divorce? I know that some marriages can’t be saved, but many don’t try at all either. We promise the Lord to treat each other like he treats his church, and that is hard work. It doesn’t come as second nature to me, that’s for sure! How nice to find your blog today! I am so glad to meet you as well Ceil! I have often wondered about how things could have turned out differently in my first marriage. I try to stop myself because I do believe all the pain we go through is to serve a higher purpose. I know one of my duties is to help other struggling women and I don’t think I would be as effective had I not been through each of my life circumstances. Love is a beautiful thing and I am thankful to have had it in my life, with both the pain and joy it has given me. Thanks so much for finding me! I love this, Candace and especially your parting thought, “We say ‘I Do’ through all the joy, frustration, and tears for the rest of our days.” That’s such a powerful way to think of it as well as say it. I’m so glad that you shared your intimate sometimes messy story today Candace. It has touched me since I’ve experienced those kinds of struggles in my marriage. And I’m certain it is a story that those who are in the middle of the pain will grab hold of and be blessed by! Thanks so much for linking this up at Wedded Wed, my friend! Looking forward to getting to know you better! Thank you Beth for your very thoughtful encouragement! I am so glad to have connected with you and look forward to getting to know you better as well. There are some wonderful posts at your link-up and I feel blessed to have found you.